a. How would you tell Del’s story to others? Why is the Del’s story so engaging? b. Go to the web site: http://www.dels.com/. What does the web site say about Del’s enterprise? How many different ways does this web site involve customers? c. Describe the channels of distribution and supply chain for a Del’s franchisee. What degree of market intensity applies to Del’s? d. How would you go about determining prices for Del’s lemonade? Should prices be different during the summer versus the spring and fall? Should prices vary when the prices of lemons and sugar go up or down? e. Prepare a list of ways that Del’s could engage its customers over a lifetime. Pick your two favorites and discuss how to implement them. f. How could the lessons learned from Del’s be applied to the sales of other products? To other food items? HATTIE: Hi. I'm Hattie Bryant. This series is about small business, and today you'll learn about a lemonade stand that has gone global. Every week we introduce you to the founders and operators of small businesses. From Tampa to Seattle and from San Diego to Boston, owners tell us how they do what they do. We call this 30 minutes a Master Class -- no journalists and no academics -- just real business owners who teach you out of their personal experience. This is probably what most of us picture when we think of a lemonade stand. It's the archetype of American entrepreneurship. HATTIE: (Voiceover) This is Charley's lemonade stand, and Charley Aberg works hard to quench his customers' thirst on a hot afternoon in Dallas. Unidentified Boy #1: You gotta give some to Michael. HATTIE: (Voiceover) In Cranston, Rhode Island, we found a lemonade stand that's been around for 50 years, and business is still growing. This is Rhode Island's pride and joy, ice, lemon juice and sugar, mixed just right and frozen. It is refreshing. So how many Dels do you think you've consumed? Unidentified Man #1: Oh, quite a few. Probably about 1,000, 2,000. Since I was little, I've had them. HATTIE: (Voiceover) Del's is so popular, both the mayor and the lieutenant governor showed up to celebrate Del's 50th anniversary. Unidentified Man #2: Here is one family that has grown a business to where it's really a very recognizable product, even outside our borders, and in turn, employs a lot of people. HATTIE: (Voiceover) Fifty years ago, in 1948, Angelo Delucia sold his first Del's frozen lemonade from this spot. Today there are 45 franchises operating in eight states, and you can even buy a Del's in Tokyo. Angelo, when did you first taste this recipe? ANGELO DELUCIA (Del's Owner): When I was about 10, 12 years old. My dad used to make this in front of his house, on his street, and then the war broke out and it just stopped. There was no more sugar and no one to buy, so he decided--and it was 10 years, and I came home from the service and they sent me to dental school. I was a dental technician. HATTIE: Your parents sent you to d--did you want to go to dental school? ANGELO: That was the government. No, I had to be rehabilitated back to civilian life through an injury. So anyways--so then I went from the dental into a bowling business. I had a partner who gambled the money that we made in the dental business, so I, in turn, decided to close it down and go into the bowling business. HATTIE: Wait a minute. You had a partner in the dental business that lost your money by gambling it away? ANGELO: No, I dissolved the company. ANGELO: And my father and I, we decided to buy this building next door called Oak Hill Bowl-Away. So my father could not stand the pin boys and he left. He left me with an exorbitant mortgage, so I decided, `Well, I'll put up a little 10-by-10 little building next door,' because lemonade was unheard of for 10, 11 years. Years ago, all the Italians of Federal Hill all made a lemonade--ice cream and lemonade. It was one of the most popular thing going. HATTIE: And everybody would do it themselves? ANGELO: Everybody would do it themselves and they would always do it to their satisfaction, their taste and that's how we started with a little White Mountain ice cream freezer, rock salt and ice. HATTIE: So way back then, your goal was to standardize the flavor? ANGELO: Right. Right. And that was done with chopped ice around a stainless steel tank in a little bucket, and I got tired of turning a wheel, so I decided to put a motor on a rack. And I got two belts and put them together and we put them around the bel--around the big wheel, and we would help it along. It made it very easy to make the product. It was--took about 15, 20 minutes to keep turning and turning. HATTIE: So you became an engineer out of necessity? ANGELO: Yeah, it was something that I didn't think I did anything spectacular. It was just, you know, a--and I was doing five gallons, selling maybe one or two. Running back to the bowling alley, watching the pin boys, staying open. HATTIE: OK. So it was to level out your cash flow through the 12 months. ANGELO: That's it. Sure. And--that's right. HATTIE: (Voiceover) Del's will squeeze nearly four million lemons this year. The large freezer stores juice, pulps and skins, all important to the secret mixture. Unidentified Man #3: We do all these peels during the winter. They're whole lemons. We have to dice them up our ourselves. We have a machine that does it. Then we have to package them. We freeze them here, so like--'cause in the summertime, you don't have enough of time. ANGELO: Because you had one machine to try to make 100 gallons; it's very difficult. And I decided, `Well, I gotta expand. How am I gonna expand?' And I opened the place on Tioque Avenue 1961, my first franchiser. ANGELO: ...with a guarantee that I give him a $10,000 net or I put the difference. `But you have to work the way I gotta tell you. You gotta start early in the morning, you gotta be there every day, and you gotta run two mobile units out of the location.' Worked out very nice. He's still down there. 1961, the fella's still down there. HATTIE: And he's making money? ANGELO: Yes. And he just opened a satellite, put his son in it. The following year, I opened the second one. The year after that, I opened the third, and the year after that, I opened a fourth, and a fifth all on consignment. HATTIE: OK. The teaching moment now to--other people could learn from you about this. And so what would you say when you want great--when you want to attract good people, when you want the business to be run right, maybe you need to give people ownership. ANGELO: Well, sure, you have to. HATTIE: (Voiceover) Bruce Long owns the franchise for Newport County. BRUCE LONG (Franchise Owner): I grew up in Rhode Island and I lived in Wickford. And when I was a little boy, six years old, I drank Del's lemonade. And here I am as an adult, I have an opportunity to be a Del's franchisee. I grabbed it immediately, and they interviewed three different people and they accepted me as their franchisee. HATTIE: Oh, you had to compete. BRUCE LONG: I had to compete. HATTIE: So you would recommend Del's to someone who's looking for a business? BRUCE LONG: If you're looking for a business, you're willing to work very, very hard for three or four months and make an annual income, this is a perfect place for it. But it's an owner-occupied-type business. It must be owner-run. This is not a business for a lawyer that's gonna hire managers. It doesn't work. HATTIE: And how do you know what's a good location? ANGELO: Well, in the winter, I used to go to a location, like Thakey's Province. I sit there for hours counting out cars with a clicker. And I'd leave and I'd look at properties, and I'd say, `Boy, there's a nice piece of property. It's on a corner, 100-by-100. I could put a little 20-by-20 building on it.' So I'd go into the City Hall, look at who owns it, forget the Realtor, I'd go up to the person and say, `Listen, I'm interested in your property. How much you want for it?' `Well, we're looking for $12,000.' `Well, gee, I gotta knock that building down. Can you make a deal?' `How about $10,000?' `That's good. It's OK.' I give them the money, I own the property. JOE REILLY (Better Community Living): We help people who are developmentally delayed adults; they live and work in a community. HATTIE: (Voiceover) Joe Reilly's non-profit organization, Better Community Living, owns a Del's franchise. JOE REILLY: Well, to get people jobs in the community is very difficult. So as an alternative to it, we decided to come up with a business to bring into New Bedford that would get people jobs. We chose Del's because it's a wholesome, family-owned business. We wanted to get a business that would build the community and in the process we would be able to build skills for the people we serve. 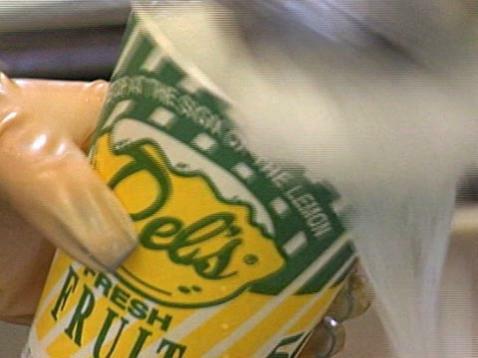 HATTIE: (Voiceover) Del's will generate $5 million in sales, with six full-time employees at the home office, 45 franchise owners, with about 300 employees serving up the icy treat in the summer. HATTIE: And what do you do around here? JOE PADULA: I do a little bit of everything, between making mix for Del's and selling franchises and selling Del's, period, you know, all those things. HATTIE: OK. You've been here 43 of the 50 years of the company's existence. JOE PADULA: Yes, I have, 43 years, and I started out picking up papers in the parking lot and just worked myself up to the position now, where I'm still picking papers up, but other things, too. HATTIE: (In the Studio) You don't have to be Burger King to franchise your business. Angelo did it because he knew he could attract more talent by franchising than simply by hiring employees. Keep this in mind: All businesses have a product, processes and people. If you want to develop a franchise organization, you must have a product and processes in place. The franchisee supplies the people. Angelo had his recipe, Del's lemonade, and he had the processes clearly defined. The processes must include standard operating procedures so that your product looks and, in this case, tastes the same, no matter where the customer experiences it. Del's franchise owners serve up the same delicious beverage in Tokyo as Angelo serves here in Rhode Island. Franchising can be a great way to grow your business. It has worked for thousands of companies, and can work for you, too.